The Email Etiquette Series is all about writing emails that people love to read. So far, we have covered the common mistakes to avoid when writing professional emails as well as the points to focus on when writing an effective business email. In this blog post, we shall explore the little tricks that ensure you’re sending the email to the right people and in the right way. In other words, we shall try to understand how to use TO, CC and BCC fields correctly to define how the recipients should read your email. When you log in to your email account and start composing a new mail or click to reply to a mail you have received, you will find 3 separate fields for entering the email addresses of the recipients. The 3 fields are TO, CC and BCC and this applies to every email provider, be it your Gmail account or MS Outlook. In case you haven’t noticed it yet, here’s a screenshot of a MS Outlook account that shows the 3 fields we’ve been talking about! So, yes you have 3 fields to enter the email addresses of the people you’re sending your email to. However, entering the email addresses randomly in the 3 fields is NOT what you should be doing. Why not, you may ask? Well, the information that follows will help us understand just that. The TO field is, according to the rules of email etiquette, meant for the main recipient(s) of your email. To be more precise, this field should be used to include the recipients who are required to take action in response to the email. These are the people whose names you include in the email salutation or the members of the group or team you’ve addressed your email to. It’s important to note that there is no upper limit to the number of recipients you can include in the TO field. So, if there are 10 or even 20 people for whom the mail is directly relevant, you should include all of them in the TO field. CC stands for Carbon Copy. The CC field is used to refer to the concept of the carbon copy as it sends additional copies of a single email to one or more recipients. 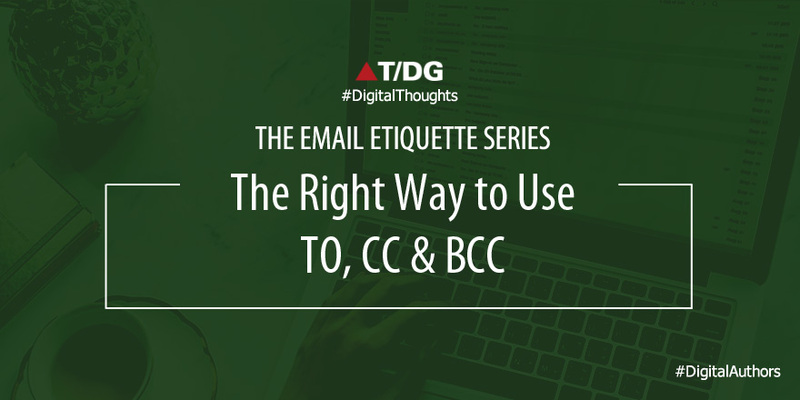 The TO and CC fields are often used interchangeably because no matter which one you use, there is little difference in the way your recipients view the email. However, the general practice is to use the CC field to send a copy of the email to people just to keep them in the loop. Email etiquette says that the people you keep in the CC field are not expected to take any action or reply to the message. In business emails, the CC field is often used to show the recipient that other important people are aware of the email and that the email requires urgent action and needs to be taken seriously. BCC is for Blind Carbon Copy. It sends copies of the email to multiple recipients, the only difference being that none of the recipients are made aware of who else has received the email. The BCC field is used when you want to send an email to multiple recipients but do not want any of them to know about the other people you have sent them to. There can be many scenarios where the BCC field might be used, and the purpose might be a desire to keep the names of the recipients a secret to one another and also protect the privacy of recipients. The most common application is for sending an email to a long list of people who do not know each other, such as mailing lists. This protects the privacy of the recipients as they are not able to view each other’s email addresses. So, that was about the email recipient fields and when to use them. Before I sign off, here’s an interesting fact. Unlike the way it works with recipients in CC, none of the recipients in BCC receive the reply posted by any of the other recipients on the same email thread. In other words, the BCC recipients cannot be part of the future communications on the mail thread and if you want them to, you need to forward each mail to them separately.